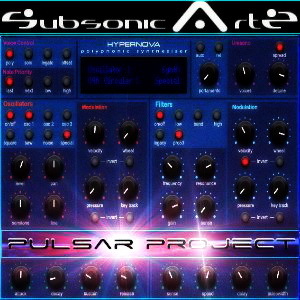 We are deeply glad to present you the Pulsar Project which is a free add-on preset pack created for HYPERNOVA kontakt library. As we instantly loved the CL-PROJECTS Hypernova library from our dearest friend Frank and were immediatly inspired to build some more patches when we tested it, we decided to build a full pack as add-on. Using the samples and engine designed for HYPERNOVA, we created Pulsar Project and wanted it to be a dark, spacy, creepy and angelic, vangelistic, futuristic, cinematic and pulsing bank. - Pulsar Project consists of more than 100 new free patches (instruments and multis). - The full version of HYPERNOVA is required to run this add-on. We hope and think that you'll enjoy this free pack and congratulate you for your purchase of the amazing HYPERNOVA library.